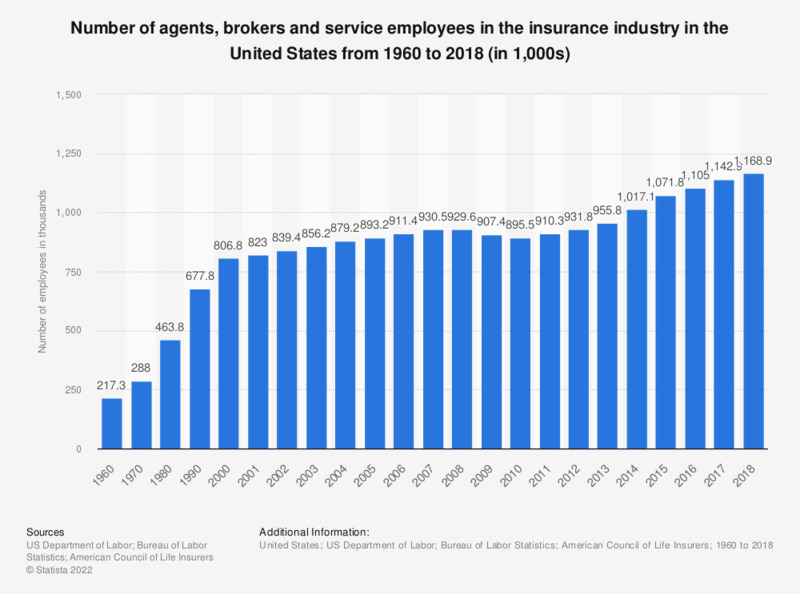 The statistic presents the number of agents, brokers and service employees in the insurance industry in the United States from 1960 to 2017. In 2017, there were approximately 1.1 million insurance agents, brokers and service employees in the United States. The number of the U.S. insurance brokers, agents and service employees has remained relatively stable during the difficult period that followed the recession of 2008 and the period of financial insecurity that ensued, and, to some extent, remains to this day. This is consistent with the general acceptance of the fact that the insurance industry is fairly recession-proof. Insurance companies tend to be conservative in a fiscal sense, and regardless of what the economy is doing, people need insurance. A further benefit which allows insurance companies a relatively high level of independence is the fact that they are generally mutual insurance companies, which answer to policy holders rather than to Wall Street. This is not to say, however, that the industry is immune to the effects of the economic situation around it. If gas prices rise, for example, consumers may decide not to buy the second car they had been thinking about, or the house extension they had been planning. This, in turn, means fewer policies sold by the insurance companies. At the same time, crime levels generally tend to rise in a period of recession, meaning higher claims made and higher payouts made by the insurance company. The economic situation and the insurance industry are reliant on one another and both require each other in one way or another for prosperity and stability. People may not think of the insurance industry as the most glamorous opportunity for employment, but employment levels have been steadily rising in the industry. Figures comprise only those on the payroll of insurers that participate in the unemployment insurance program.